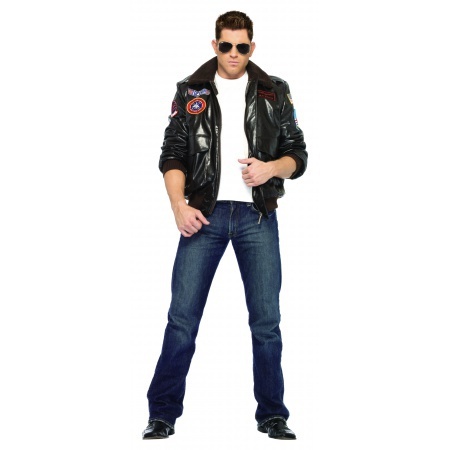 This Top Gun costume includes Top Gun bomber jacket with embroidered patches. Play Tom Cruise's character Maverick from the hit 80's movie Top Gun. This Top Gun costume is perfect for a 1980's theme costume party or occasion. Our Top Gun bomber jacket costume set is an offically licensed Top Gun movie costume. Aviator glasses, T-shirt and jeans are not included. This Top Gun Men's Bomber Jacket Set comes in adult sizes Medium, Large, Small. This Top Gun Men's Bomber Jacket Set is an officially licensed Top Gun costume. Remember the 80's when Tom Cruise was cool and every guy wanted to be a hot shot naval aviator? Now you can be just as cool as Maverick in this officially licensed Top Gun bomber jacket set.